Saigon River Express provides you with many different tours visiting different areas in Southern Vietnam. The transportation is usually water taxi and ferry. There are two popular tours at Saigon River Express: Cu Chi Tunnel Tour and Mekong Delta Tour. On Cu Chi Tunnel Tour, you will get on a speed boat from Ho Chi Minh City to Cu Chi. The tour guide is on the boat with you and ready to explain to you the special characteristic of this land. It takes you about an hour or an hour and a half to get there. 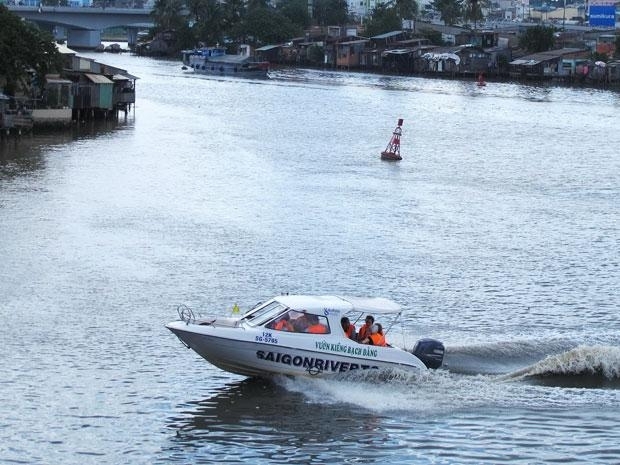 On the way, you can enjoy the beautiful scenes on Saigon River. When you get off at Cu Chi, you can have lunch which is already included in your ticket and then get back to Ho Chi Minh City. They usually pick you up at Renaissance Riverside Hotel at about 7a.m. If you want a pick-up from your hotel, you can arrange with the company itself and no extra fee is charged. A typical Cu Chi Tunnel Tour is about $69/person. The booking can be made through email and payment can be made later when you are on the tour. The Mekong Delta tour is also very interesting. Just like Cu Chi Tunnel Tour, the tour starts at 7a.m. You get on a boat and head to Mekong Delta. Along the way, you can see the views of Ho Chi Minh city from Saigon river. Then you are sent to the many lush green canals which are typical of Mekong Delta. The tour guide is very friendly and enthusiastic, and he can give you much informative and interesting knowledge about the beautiful sight seeing on the way. When reaching Mekong Delta, you can visit local riverside markets, the authentic villages with colonial architecture, local pagodas and many different workshops. The lunch is served in a local pagoda, which is an awesome opportunity to taste Vietnamese traditional dishes with high quality made by the chef who is brought along the tour. Around 1p.m., you can head back Ho Chi Minh City. The fee for this tour is about $92/person including all the fees of pick-up, breakfast, lunch, tour guide and drop-offs.